In order to protect aquatic and riparian ecosystems, we need to understand how freshwater ecosystems will respond to future climate change, as well as changes in land-use, pollution and water demand. 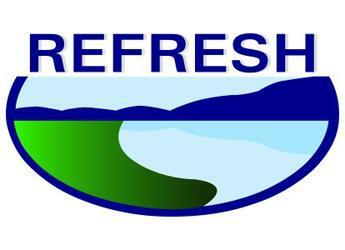 Creating the scientific understanding that enables such measures to be implemented successfully is the main focus of the REFRESH project. It is concerned with the development of a system that will enable water managers to design cost-effective restoration programmes for freshwater ecosystems at the local and larger catchment scales, that account for the expected future impacts of climate change and land-use change, in the context of relevant policies such as the Water Framework Directive (WFD) and the Habitats Directive. The study will focus on specific measures that might be taken to minimise the consequences of climate change on freshwater quantity, quality and biodiversity. The focus is on three principal climate-related and interacting pressures 1) increasing temperature, 2) changes in water levels and 3) flow regimes and excess nutrients. There is a particular focus on lowland rivers, lakes and wetlands because it is often particularly difficult to meet policy requirements in those areas. Stakeholders will be involved to explore the relevance and applicability of various future scenarios, and to explore barriers to the implementation of adaptation and mitigation strategies.